Can You Spell Mississippi? | LIVING IN THE PACIFIC - Philippines to Guam... One Day at a Time! Can You Spell Mississippi? – LIVING IN THE PACIFIC – Philippines to Guam… One Day at a Time! 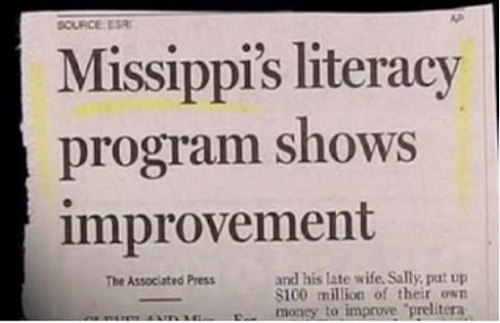 A recent news article that appeared in a printed newspaper was intended to confirm the good news that Mississippi’s literacy rates were improving….I think someone missed the mark! That’s Just Dumb! As an update to this post, a filipino acquaintence of mine recently asked me if I could spell Mississippi with one I (eye). I fell for it, one of the oldest jokes in the entire joke inventory. This entry was posted in X,Y, & Z! and tagged dumb, funny, goofy stuff, literacy, makes no sense, Mississippi, silly, spelling. Bookmark the permalink.